August 31, 2018 : Personalized Learning. Supply List Addition. Staff. Improvements. Enrichment. Community Events. Open School Night. Alumni. The students are back and we are glad they are here! We have had two fantastic days to begin school! We all know that every child learns differently and great minds do not think alike. In our new personalized and blended learning, we will continue to use technology to support and enhance personalized learning by providing web-based resources. For new parents, we define personal learning as learning that fits the needs of each child; we define blended learning as the blending of traditional teaching with online resources. At Wednesday’s Professional Development Day our teachers spent the day with Alan Barnicle, Diocese Coordinator of Personal Learning, and Stacy Clements, Diocese Personal Learning Coach, on the new Personalized Blended Learning Model. This year, as you know, we plan to have all K-8th-grade students spend time one period each day in their class using the Station Rotation Model. The Station Rotation Model is when students rotate through different learning stations set-up by the teacher with at least one of the stations being a teacher-led station and one of the stations dedicated to online learning. The Station Rotation will be dedicated to different subject content each day. The advantages of the Station Rotation Model are that it creates smaller learning groups within the larger class; it employs a variety of tasks and activities to increase student engagement, it allows teachers to differentiate instruction based on individual needs, it allows students to engage with information in different ways, and it makes it possible for teachers to spend even more time working directly with individual students to improve their learning outcomes. You will be hearing more about this exciting new education shift from your child and at a special Family Night in October. Stay tuned for more information. Important addition to our school supply list: we are asking each student in grades Kindergarten through 8th-grade to bring in a headphone or earbud to keep in school for use during the Station Rotation Period. I do have one important late staffing change. Ms. Pam Zmek, last year’s 4th-grade teacher, gave her notice in late August to transfer to St. Rose of Lima School. Ms. Zmek had a very long commute each day and her commute time will now be cut in half with this transfer. I thank Ms. Zmek for her service to our school and wish her the very best as she continues her teaching career. I am very happy to tell you that Ms. Kelly Kirby has accepted the position. Ms. Kirby has her degree from Iona College in New Rochelle and has 13 years’ experience teaching 3rd or 4th-grade. The last 8 years, Ms. Kirby taught 3rd and 4th-grade at the Westover Magnet School in Stamford. We found Ms. Kirby to be delightful and to possess a deep knowledge and love of teaching. Her references describe her as a “gem” and “our loss is your gain.” Her former Principal at Westover Magnet School said simply, “She’s amazing.” Ms. Kirby will take over the class as soon as she is cleared by the Diocese. We are so blessed to have Ms. Kirby teach our 4th-graders! Have you notice that you hear Spanish being spoken more and more in public? Well our students have heard that too and over the last several years, we have seen a dramatic reduction in the number of students signing up to take French. Because of this low enrollment, this is the last year that we will be offering French and we will be offering it just to our 8th-graders. This means all our 5th through 7th-grade students will be taking Spanish this year. After Ms. Fox resigned this summer, we were very fortunate to hire Mr. Burt Beshi to teach French to our 8th-graders. 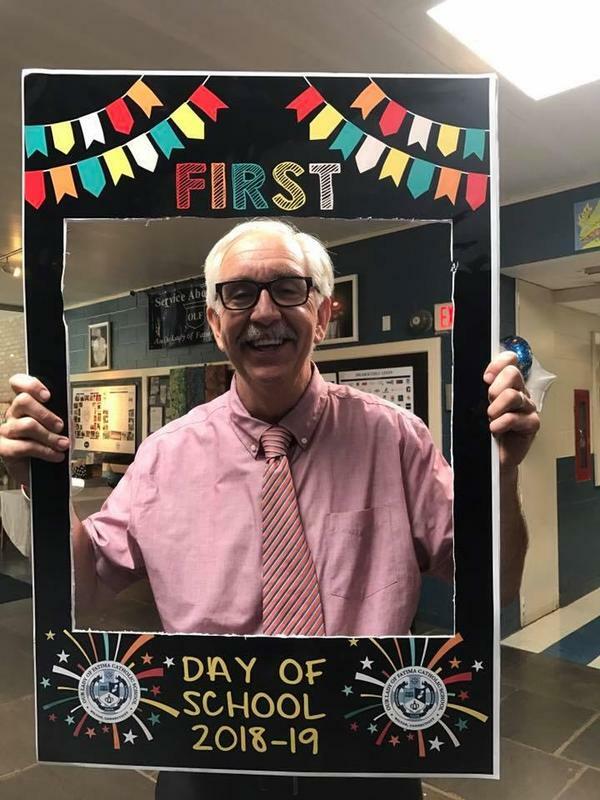 Mr. Beshi received his college degree in Albania and has been teaching French for over 25 years and has taught French for the last 11 years at Bethel High School. His references at Bethel describe him as he “cares about kids,” that he is a “very kind man,” and that he “has a strong content knowledge in French.” Mr. Beshi will begin teaching our 8th-graders next week after he is cleared by the Diocese to start teaching. Important notice for after-school parents. The after-School has a new home. It is now located in the middle module in the back of the building. Over the summer we had several construction jobs going on to get the building ready for the students. Here are a few of note. Since I arrived here two years ago, I have always heard of the “Fatima Family.” I really saw and experienced it in action during this past hot August. Our two school playgrounds were in desperate need of weeding, new mulch and a general makeover. Over several weeks, members of the “Fatima Family” came together and weeded the playground and then spread new mulch. It was hard work with the crab grass coming out best with shovels and through backbreaking labor. Many thanks to members of the Davis Family, Doyle Family, Carbin Family, Bowron Family, Fleming Family, Murphy Family, Vizza Family, Barska Family, Lussier Family, DeGuzman Family, Pace Family, Pariza Family, Highland Family, Salageanu Family, Wang Family, Vallerie Family, and Steele Family for volunteering their time and their efforts. They were assisted by the volunteer efforts of the Knights of Columbus of St. Mathew’s Church. After weeding, an amazing 130 yards of new mulch was put down and the playgrounds now look fantastic. Speaking of looking fantastic. Please stop and see the middle module behind the school with its beautiful new bathroom. The middle module is now our second Pre-K classroom’s with the Pre-K doors right across from each other. Due to the construction efforts and skill of parent and carpenter, Declan Carbin, we now have a beautiful new bathroom in this module. In addition, Declan noticed and took time to repair some roofing, replace aging facial boards, and fixed toilets in the school. He is truly a “Master Carpenter.” Thank you, Declan! Finally, Pre-K parent and house painter, Julio Interiano, noticed that the wall of the first module facing the blacktop, which is now our Art room and science lab, was in need of fresh painting. We provided the paint and Julio sent over two painters from his crew to repaint this wall. Thank you, Julio! Exciting school enrichment news: New this year we will offer a Chess Team for students in grades 3-8. Practice will be after-school on Wednesdays and we will compete in two U.S. Federation Chess Tournaments. We plan to travel to one tournament this fall and host our own tournament in spring 2019. During the summer, my family and I got to hear some great fiddle music at a fiddle festival in Nova Scotia. Most of the fiddlers we heard had been classically trained. I am happy to announce that we will have Andrew Knebel and Music for Kids back at our school. Mr. Knebel teaches violin lessons for students in Pre-K 3 through 8th-grade. The lessons are once a week and lessons are in groups of two to four students. The lessons will begin in early October. Registration is online at www.musickidsprogram.com. Please consider having your child sign-up. Cross-Country Update from our Coach, Ms. Ambr Pace: Cross-Country practice will begin on Monday, Sept 17. Cross-Country practice will take place on Mondays and Wednesday between 3:00 and 4:00 p.m. and is open to all 5th through 8th-graders. Our first meet is September 27th. Please turn in your forms to Ms. Favier in the school office. Come join the fun! We have several important and fun family dates to look forward to. On September 7th there will be the annual School/Parish Family Cookout from 5:00 to 9:00 p.m. Please RSVP at the Parish office at 762-3928. On September 13th we will have our Open School Night Dinner and Social. This will be an important evening where you will hear about your child’s curriculum and school day and then transition into a dinner and social event where we will set-up the committees to plan and carry out some of our great events we have each year. This evening is just for parents. Given we have so many new families, a request for everyone with that “long walk” from the parking lot to the back of the school each morning, please make sure we greet each other as we entering or leaving the school. In our small school, everyone needs to do their part to make sure that all parents and families feel welcome and accepted. I know many of you already do this each day and I thank you for setting this important welcoming tone to our school. Hawaiian Luau Update: Aloha! Do you want to head back to the Davis Family’s little grass shack down in Norwalk, Connecticut? This year, their backyard becomes a Fatima Blue Hawaii, with a September 8th - LUAU! Grab your Honolulu Baby and hula on over to where all the fun is! (Grass skirt optional.) Limit 40 people. $65/pp Donated by the Davis, Doyle, Pace, and Robinson Families. There are fourteen spaces remaining so please sign-up! Carmel Bowron. Carmel has been here helping at school this summer in so many different and important ways. She was here on the first day of school taking individual student pictures to be given to parents at our Open School Night. Also, over the summer, Carmel took home and washed and sorted all the donated uniforms. The uniforms are now hung on hangers at our back door. Carmel also helps Susan McCall and Margaret O’Brien keep our FatimaFamilies Facebook page updated. Also, Carmel was instrumental in getting the St Mathew’s Knights of Columbus to assist in refurnishing our playgrounds. Thank you for these activities and all you do for our school, Carmel! Ryan Caroll graduated last June and is off to St. Joe’s High School this week. During his first day of Kindergarten when he was here at Fatima, an older student gave him a baseball cap to help ease his fears with this big transition. Ryan never forgot this act of kindness and he was back in school Wednesday for our New Student event and now Shane Fleming who is new in kindergarten is proudly wearing a new baseball cap given to him by Ryan. That is Fatima Family as its best! September 7th – Parish/School Cook-out in front of the school from 5-9. All are welcome. September 13th – Open School Night Dinner and Social beginning at 6:00 p.m.